As much as we can beg and plea for the name of the eventual team to be the Las Vegas Rat Pack, we all know it’s almost certainly going to be the Black Knights. So, we figured it’s only fair if we let Isaac loose on that name. What he came up with is nothing short of stunning. The simplicity is what really makes these special. I can see that logo plastered all over the city without needing words explaining what it’s promoting. It’s also a far cry from the Army Black Knights logos so there’s no issue with confusion there. I keep envisioning myself wearing Las Vegas NHL gear every day of the week. 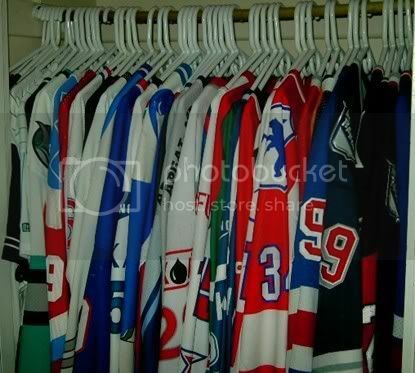 I wish Bettman and his boys would just pull the trigger already, I need some new stuff. 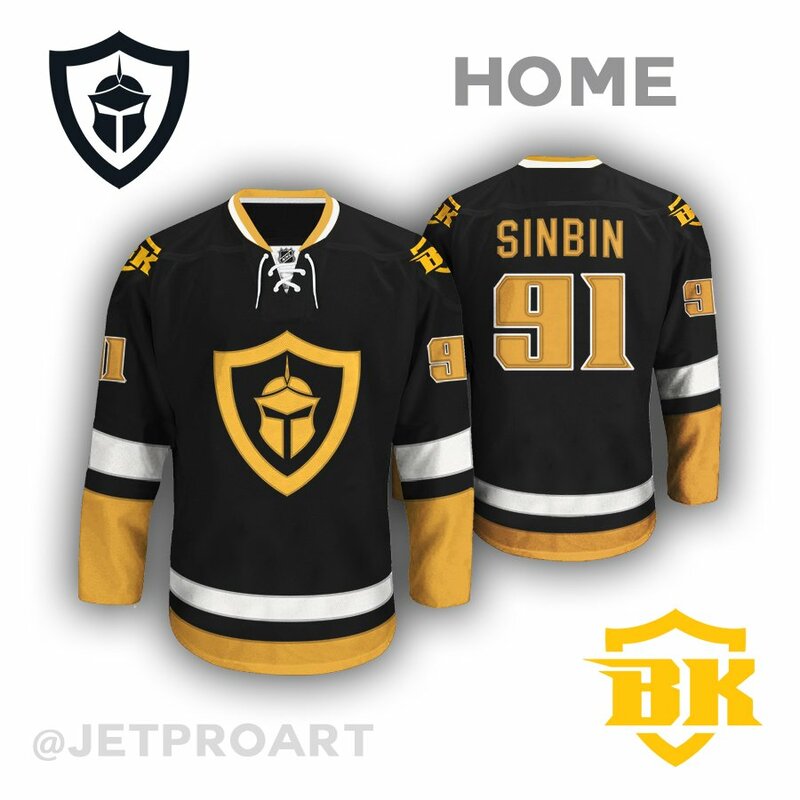 Have to admit, people are starting to think I’m weird for wearing my SinBin.vegas Committed T-Shirt every single day. 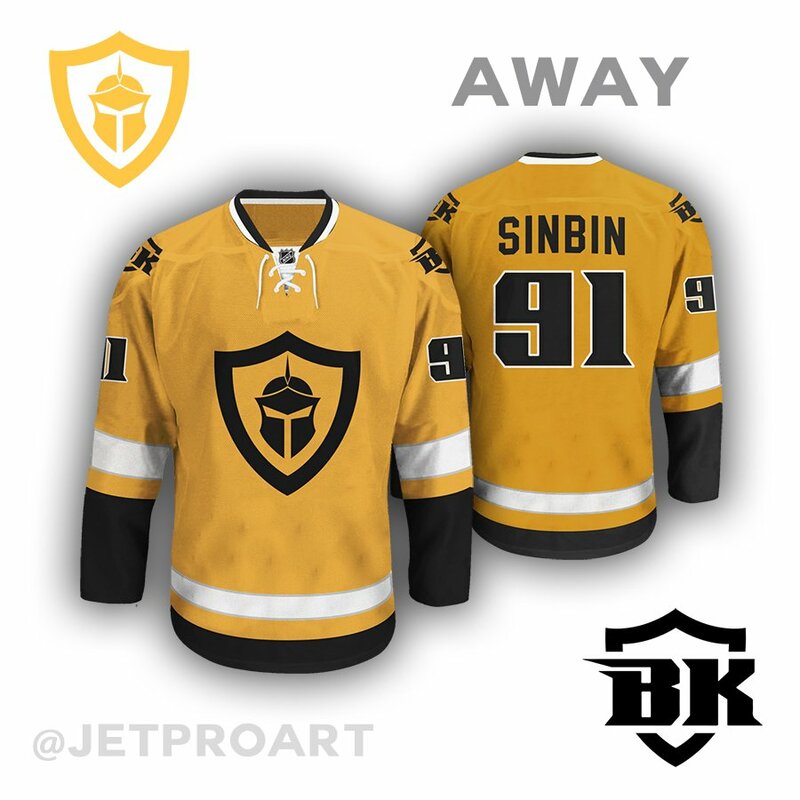 Once again, special thanks to Isaac Palestino for designing these jerseys exclusively for SinBin.vegas. Do us a favor and give him a follow on Twitter, would ya. Want more? Take a look at the rest of our jersey designs. Dont use the yellow ! Black – Home and White- Away is fine. It’s the Bruins!!!!!!!!!! Oh wait……. Don’t like the yellow color either. Actually like the name side winders better than the knights. Like to see the Vegas Scorpions, or the Vegas Express, or the Vegas Night Hawks. The logo looks awesome! Love the clean design, like the ’90s Penguins logo, the Stars logo or the previous Leaves logo! The logo is great, and the colors are different. The away jersey is also cool. The designer has a video of the whole design. Check it out. Thanks for posting that video, I liked the grey they used though don’t like laces. Just remember some of those designs would be brutal trying to buy merchandise for like hats stitched etc. For example if are a Kings fan, many items they butcher the crown in the logo. Even if buy the older merchandise its a real pain having it produced where they don’t flub the imagery. Its hit or miss buying a lot of gear for Kings, even Sharks some stuff loses the lower lip biting the crown. Jabberwocky idea is really cool for kids or over aged adults ;). I prefer the image of the knight helmet over the Ducks type B in the flowing logo for team. I agree to dump the colors totally it is stupid and confusing. Besides the play on “nights” for Vegas “Knights” is really pretty cool if they used that name. Also it would limit the colors used on jerseys or make some not fit since it isn’t black knights themed ;). I think there was an Sega or Saturn game Vegas Nights or something odd like that too :). The grey in the video version is the best out of the options shown though not a fan of the logo. Away option 2 would be the best of the rendered ones though I don’t like the gold. Replace that with the dark grey or some other color… Hate anything with laces especially an expansion team it defies any logic to use. I feel they look real stupid besides annoying for any jersey with them. I’ve thought of names like Heat, Ice, or Vice, rather it just be “Knights” so its a play on “Vegas Nights” instead of dragging color into it. getting rid of laces on the Home, replacing Golden with the color silver like the LA Kings used in 88 version of jersey for letters/numbers would rock. BK would mean getting sued by BurgerKing along with mocked badly in ottawa when Hamburger is in net ;). That golden hue/color loots too much like the mustard from Nashville which makes that team less cool and original. The Knight inside the logo not being colored black would make the name seem a bit stupid… Like why are the Gold Knights called the BK? 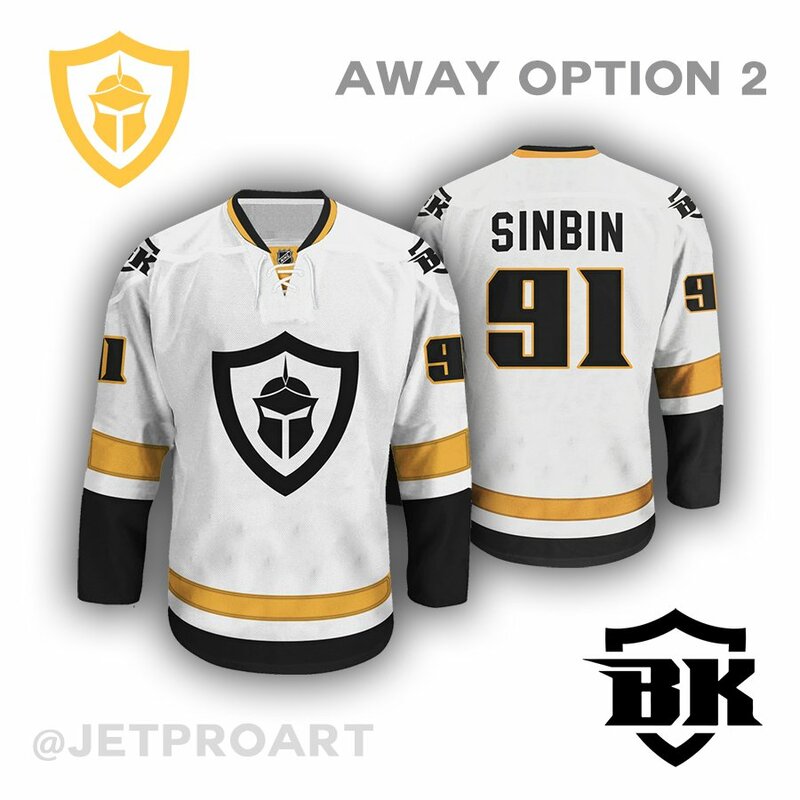 Best look would be taking the grey jersey in video posted in comments… Replace that with the Knight head logo turning all those gold colors to the silver like the Kings had. Also lose the laces, that would give them at least a real cool home or alternate home jersey. Using Las makes it look too much like LA Kings so I prefer just Vegas when using words. You can also use black over grey while having the grey in the logo to contrast making the Knight head Silver. Thanks for taking the time to show the concepts even if I’m not crazy about any of them. There several other options that least have some really cool colors or aspects that could be used for this :). I like the grey as a third jersey or optional as a home jersey. The gold is a bit tough to pull off but if you do it rite the gold can be out standing. You just have to be careful it doesn’t get yellowed like the old kings or Nashville’s. I really like the castle design in the black for the arms, the waist and the socks. I hadn’t thought of that but it works really really well. The 2nd design is the best out of the three in my opinion and would be the easiest to have reproduced and stitched for marketing. I would suggest a few slight changes though. Take the knight helmet and make it look forward and down a bit, you’ll see the top of the helmet and it allows for an alternate logo for holidays or special occasions by adding eye’s (say for Halloween )or a ( say for Christmas) beard. Also for the shoulders I love the chevron design but make the other shoulder a different design.